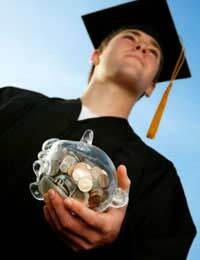 Home > Funding Postgraduate Study > Can You Afford Postgraduate Study? For thousands of graduates keen to continue studying, the cost of postgraduate study can be a problem. The fees and living costs associated with postgraduate study can deter or even prohibit individuals from embarking on Master’s and PhD courses, particularly now that students are coming out of their undergraduate degrees with high levels of debt. To work out whether you can afford to pursue postgraduate study, you should first make a list of all the costs that would be involved, from course fees to rent payments, and identity the sum you need to come up with. The next step is to work through your funding options. Am I likely to receive funding? If you don’t have the savings to pay for your MA or PhD, it is important to ask yourself whether you are likely to receive funding or any other support towards your course fees and living costs. If you achieved or are set to achieve a first at undergraduate level, you may be a good candidate for Research Council funding. Bodies such as the Arts and Humanities Research Council (AHRC), Medical Research Council (MRC) and The Natural Environment Research Council (NERC) offer generous financial support to students who excel in their fields. If you are unlikely to receive Research Council funding, you will have to find other means of meeting your course and living costs if you are to embark on postgraduate study. If you have already begun your career, your employer may be willing to fund a relevant part time MA or PhD qualification. Alternatively, the university to which you are intended to apply may offer grants, bursaries or studentships for which you might qualify. Be sure to check whether you are eligible for a Professional and Career Development Loan, too. This is a bank loan, between around £3, 000 and £10, 000, that remains interest-free during and for one month following your period of study. To qualify, you must be 18 years of age or over, ‘settled’ in the UK and intending to work in the UK, EU or the EEA when your course finishes. How much can I earn by working part-time? Take the time to carefully assess your part-time earning potential. Are there many jobs in the area in which you are planning to study? Will you be able to find flexible employment? How many spare hours will you have free to work in a given week? Jot down your potential income over the duration of the postgraduate course, along with details of your current savings. Be conservative when it comes to your expectations around awards, grants and scholarships, as competition for these is often remarkably tough. Now is the moment of truth. Compare your anticipated income and with your anticipated outgoings. Will the amount you are set to receive in bursaries, through loans and from part-time employment cover the costs of your postgraduate study? If you find that you are able to afford postgraduate study, be sure to consider whether it is what you really want. Will it be worth the money? Will you enjoy your degree? Will it be a benefit to you professionally and academically? On the other hand, if you feel put off by the expected high cost of further study, take the time to consider whether it will prove a sound investment. It has been shown that, in most areas of employment, those with postgraduate degree qualifications earn on average 20 to 30% more than those with only undergraduate qualifications. I'm Fely taking up BS Fisheries II at University of the Philippines Visayas. I'm seeking for some help and sponsor to cater my needs as a student because my parents can't afford everything. Thank you and please help me.